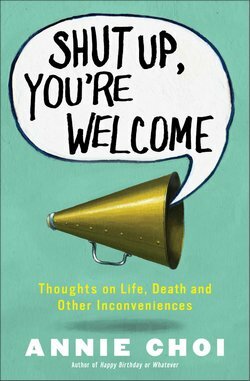 Hard as I looked, I didn’t find the answer in any of the hilarious essays of Shut Up, You’re Welcome: Thoughts on Life, Death and Other Inconveniences. Instead I found sprightly anecdotes galore and prose technique to rival the best humorists now working in this style. Korean-American, LA-based Choi writes comedy for the page: standup-flavored material that’s meant to be read rather than heard. That’s not at all the same thing as writing for performance. In the books of some comedians (or their gag writers) seem to drip-feed a transcript of somebody’s act. It takes a doubly literary skill—joker and essayist—to narrate the funny so that it reads well. And it’s rare that a writer can pull it off as neatly as Choi does. Set-up, punchline. That quasi-standup quality again. The subject matter helps—it’s in the comedic tradition to fixate on awkward trivialities like ugly and missing underwear—but here it’s mostly down to style. Of course, in writing you can’t rely on gesture, face-pulling, ad libs, or any other of the performative aspects of actual standup. Instead, you have all the thrills of punctuation, syntax and paragraph structure. I couldn’t agree more. Still, for someone who claims to hate musicals, Choi knows a surprising amount about them. Dozens of them. To my ear this absolutely works. The stilted ESL accent of the set-ups—where’s the indefinite article?—somehow makes straight feel even straighter. Probably the most literary chapter is “Hex Marks the Spot,” in which a hexagonal kitchen table develops as a metaphor for family unity and the triumph of tradition over common sense. The Chois’ refusal to replace this battered, splinter-inflicting furniture…and their botched efforts to refurbish it…symbolize the uneasy fit of a transplanted set of values. This is really what most of the anecdotes are about: a woman trying to cope with the residue of another culture, mostly in the form of parental wisdom, without getting unduly annoyed. Hard as it is to find something negative to say about Shut Up, You’re Welcome, it’s not impossible. Late in the book a soul-searching quality enters in and displaces much of the wit. Choi explains why she doesn’t want marriage or kids; notes the challenges of finding a serious partner who doesn’t want them either. Is this the humor-essay equivalent of a comedy-drama—light at the outset, gloomier towards the end? To be fair, it’s good technique to bring out your best material early. The drawback? After a brilliantly funny first half, the late chapters arrive as a relative downer. Some people—sad people, in my view—will ask if Choi’s book is “relatable.” They’ll want to know how it squares with their own experiences, apparently as a prerequisite to being able to laugh. The answer—some of it is maybe too relatable (as in an overfamiliar chapter about learning to drive) while the rest won’t be relatable enough. Most readers won’t recognize themselves in Choi’s anecdotes. I know I don’t. But then, you don’t have to be a Korean-American Valley girl to get into this stuff. Shut Up, You’re Welcome stands as a mature work of unusual comedic skill. Choi even tackles Korean cuisine without joking tastelessly about barbecued dog. This shows amazing restraint. Most humorists wouldn’t be able to resist. Will George writes about humor and lives in Toronto. He even has a website (www.willgeorge.co).